To evaluate the current practice of trabeculectomy among the United Kingdom & Eire Glaucoma Society (UKEGS) members. Cross sectional survey of glaucoma specialists in the UK. Glaucoma specialists' members of the UK & Eire Glaucoma Society (UKEGS). A 32 question online survey using a survey monkey web link was sent to the UKEGS members. All non-responders and partial responders were sent a reminder to complete the survey. Responses relating to the surgical & non-surgical aspects of trabeculectomy surgery. The response rate was 67.6% (142/210) and the vast majority of the respondents (88%) were glaucoma consultants. Eighty percent of the respondents performed > 10 trabeculectomies per year and 70% performed primary trabeculectomy, majority of which (> 2/3) only did this rarely & in cases of late presentation. Progressive visual field loss was the most common indication for trabeculectomy. Majority (48.39%) use sub-tenon's block without digital massage/weight/Honan's balloon. About 89% used antimetabolites of which 99% used Mitomycin C (MMC) and the majority (60%) use this just after conjunctival peritomy. Most (80%) use 0.2 mg/ml of MMC and 58% use this for 3 minutes. Majority (57%) used their own self modified Moorfield's safe surgery technique & 88% perform a PI during trabeculectomy whereas 12% don't (in pseudophakes, myopic and where patients are on anticoagulation). Most (56%) use an AC maintainer (1/3 of them always). Only 29% performed phaco trab' regularly (2/3rd used different sites), 44% never. This survey highlights a varied spectrum in the practice of trabeculectomy. This may reflect some paucity of good evidence to guide uniformity in the various aspects of trabeculectomy. Glaucoma is the second leading cause of blindness worldwide  and the most widely used surgical procedure for glaucoma is trabeculectomy, which creates a guarded fistula between the anterior chamber and the sub-conjunctival space . Although the history of surgical management of glaucoma dates to 1856, when Von Graefe introduced iridectomy as a treatment for acute glaucoma; the history of trabeculectomy is relatively short [3-5]. After the description of trabeculectomy in 1961 by Sugar  and by a Greek ophthalmologist Koryllos  as guarded penetrating filtration procedure in 1967 and later on works by Cairns, an ophthalmologist in Cambridge, lead to the introduction of the modern Trabeculectomy procedure which he published in 1968 . The term trabeculectomy itself is a misnomer as the trabecular meshwork is not necessarily excised during the procedure. The procedure involves excision of the cornea along with sclera to create a transcleral fistula . As trabeculectomy is the mainstay of surgical treatment of glaucoma; there has been many a refinement and modification of this drainage procedure since its initiation. Refinements have been in the form of instrumentation, suture materials, modern operating microscopes, safer surgical techniques and the use of anti-scarring agents to modulate wound healing and achieve more flow with higher success rate [9-13]. Trabeculectomy, once considered the gold standard for the management of the advanced and progressing glaucoma is gradually being replaced by less invasive and minimally invasive glaucoma surgery (MIGS). Glaucoma surgeons are now including various MIGS procedures including iStent, Trabectome and Xen implants for an increasing number of their patients [14-19]. Tube Shunt procedures are also widely practiced throughout the UK and internationally but are usually reserved for resistant cases . There is a large body of literature at present with regards to outcomes and complications of trabeculectomy surgery. While trabeculectomy is quite successful in experienced hands  it can also be unpredictable and carry significant risks [22,23]. There are currently no national guidelines on trabeculectomy in the UK or from the European Glaucoma Society (EGS), neither is there any preferred practice pattern on trabeculectomy procedure itself from the American Academy of Ophthalmology (AAO). In the absence of national preferred practice guidelines, there is bound to be variations in the practice of trabeculectomy. This national survey was done to assess current practice patterns on trabeculectomy surgery done by UK based glaucoma specialists for a UK population base. Therefore, for the first-time national comparisons can be made, and common practices highlighted to enable surgeons to provide a more standardized and uniform service. A cross sectional national trabeculectomy survey was created using surveymonkey.com and a questionnaire weblink was distributed to the members of the United Kingdom & Eire glaucoma society (UKEGS). UKEGS is the national body that represents the glaucoma specialists in the UK. The survey link was sent electronically to all the UKEGS members. Reminder emails were sent to nonresponders. The survey consisted of 32 questions which aimed to ascertain the surgical and associated non-surgical peri-operative aspects of trabeculectomy. The first 5 questions focused on the surgeon's grade and experience, ascertaining their designation and the number of trabeculectomies performed. The next 23 questions focused on current practice methods regarding surgical technique as well as perioperative treatment choices. Remaining questions examined the various complications experienced by surgeons and treatment protocols in penicillin allergic patients. The final group of questions looked at post-operative follow up regimes and audit practice as well as general opinions on the future of trabeculectomy surgery in the UK. Due to the extensive nature of this national survey and the amount of responses generated, it was not practically possible to cover all the aspects in a single article, so this article only addresses the surgical choices and practices of trabeculectomy in the UK. The response rate was 67.6% (142/210) and the vast majority of the respondents (88%) were glaucoma consultants (Figure 1). Eighty per cent of the respondents performed > 10 trabeculectomies per year. Twenty-one per cent of the consultants were doing more than 60 trabeculectomies per year, 21.58% were doing between 41-50 trabeculectomies and 36.69% were doing less than 30 surgeries a year. Twenty-four per cent prefer to perform primary trabeculectomies; however, 47.83% perform a primary trabeculectomy if the patient presents late with advanced glaucoma. Progressive visual field loss and uncontrolled IOP despite maximal medical treatment were the most common indications for trabeculectomy. Sixty nine percent of the respondents checks IOP just before the surgery on the day (20% occasionally) but 30% of the respondents do not check IOP on the day (Figure 2). Of the various anaesthetic options; majority (48.39%) use sub-tenon's block without digital massage/weight/Honan's balloon, 15% use sub-tenon's block with digital massage/weight/Honan's balloon, 13% would prefer general anaesthetic (GA) in all cases if possible and 20% would prefer GA in advanced cases of glaucoma. Twelve percent use peribulbar block with digital massage/weight/Honan's balloon, 13% use peribulbar block without digital massage/weight/Honan's balloon and 6% use topical with intracameral unpreserved anaesthesia. More than ninety eight percent of the glaucoma specialists use antimetabolites during trabeculectomy (Figure 3). Eighty one percent use only mitomycin C, 17.57% use mostly MMC, but occasionally 5 fluorouracil (5 FU), and the rest (over 1%) only use 5 FU (Figure 4). On the question of when they avoid antmetabolites; 67% of the specialists always use it, 31% avoid it in patients with very thin conjunctiva & where there is increased risk of bleb leakage and hypotony, the remaining 2% avoided antimetabolites in elderly patients over the age of seventy. The majority (60%) apply antimetabolites just after conjunctival peritomy, on the sclera before creating partial thickness scleral flap, 23% use it after creating a scleral flap and 9% would use antimetabolites either before or after creating scleral flap. Most (80%) use 0.2 mg/ml of MMC and 20% use 0.4 mg/ml concentration of MMC. About 8% use different concentrations from 0.1 mg/ml to 0.5 mg/ml of MMC. With 5 FU the preferred concentration is 25 mg/ml (used by 4%). The majority (58%) use antimetabolites for 3 minutes, 17% use it for two minutes, 13% use it for one to three minutes and only 4% use it for up to 5 minutes (Figure 5). As to the actual technique of trabeculectomy surgery; the majority (57%) use their own self-modified Moorfield's safe surgery technique, 29% use the actual Moorfield's safe surgery technique, 7% use their own technique entirely, 7% use their self-modified Cairns's technique and only 0.79% used the original Cairns's technique (Figure 6). Eighty eight percent of the glaucoma specialists perform a peripheral iridectomy (PI) during trabeculectomy whereas 12% don't (in pseudophakes, myopic and where patients are on anticoagulation). Most (55%) use an anterior chamber (AC) maintainer (1/3 of them always) and 45% never use an AC maintainer during trabeculectomy. Of those glaucoma surgeons who use AC maintainer occasionally do so for vitrectomized eyes and those requiring revision of trabeculectomy. Majority of glaucoma surgeons (43.65%) do not perform combined phaco trabeculectomy; however, 29.37% of surgeons perform combined phaco trabeculectomy. About 28.57% of surgeons do phaco trabeculectomy occasionally if there is significant cataract, shallow anterior chamber, if surgery has to be done under GA, if the patient was elderly patients and for other social issues. Of all glaucoma surgeons about 42% of surgeons use different sites for phaco and trabeculectomy as compared to 15.52% surgeons using the same site for phaco trabeculectomy and 8.62% would use either of these based on the particular case. On the question of the future of trabeculectomy surgery, less than half (44%) felt that it was the gold standard and is here to stay, the majority (69%) felt that trabeculectomy and MIGS (Minimally Invasive Glaucoma Surgery) could happily coexist in a happy mix to suit appropriate patients. Five percent felt that the future of trabeculectomy is questionable as it is too unpredictable; however, only 0.83% felt that the future of trabeculectomy is in danger from minimally invasive glaucoma surgery (MIGS) like iStents, trabectome etc. About 43% felt that the data from the original UK national trabeculectomy survey is outdated and made most of our results look comparatively superior and a repeat national trabeculectomy audit is required (Table 1). The aim of the trabeculectomy surgery is to provide an alternative pathway for the drainage of aqueous externally in to the subconjunctival space. Done rightly, it provides much better control of intraocular pressure as compared to other procedures, but this is an invasive surgery and there are risks of complications. The last UK national trabeculectomy survey was undertaken in 1996  and since then in the past two decades; there have been many advances in the trabeculectomy technique, making it much safer with improved outcomes. Due to the constantly changing trends in glaucoma management, newer innovative techniques and modifications in the techniques have made the procedures safer and thus the results from the previous survey may be somewhat outdated. The previous National Trabeculectomy Survey in 1996 included feedback from 384 consultants and included 4 consecutive trabeculectomy cases sampled retrospectively and followed prospectively . The respondents were by and large non-glaucoma specialists (77.5%) and only 22.5% were glaucoma specialists. Our survey targeted only the glaucoma consultants and ophthalmologists with special interest in glaucoma. With 88% of the respondents being glaucoma consultants completing the survey makes it very glaucoma specific and representative. The results are therefore, highly reflective of the current practice of trabeculectomy surgery in the UK. A study by Siriwardena and associates in 2004 showed that 87% of the ophthalmologists were performing trabeculectomy surgeries . In our survey all the responders were performing trabeculectomy surgery. The majority of the surgeons (63.30%) are performing more than 31 surgeries per year with 21% of surgeons performing greater than 60 trabeculectomies per year. Only 10.07% of surgeons were performing less than 10 surgeries per year. The amount of trabeculectomies in the UK is still impressive with majority of surgeons still performing trabeculectomies although the number has decreased as compared to past decades due to the introduction of minimally invasive glaucoma drainage devices and better control of IOP with medical treatment . A survey by Desai in USA, published in 2011 also showed a decreasing trend in trabeculectomy surgery from 80.8% in 1996 to 45.5% in 2008 . The Choice of anaesthesia for patients undergoing trabeculectomy surgery is important to avoid vision threatening complications like 'wipe out'. Retro-bulbar anaesthesia is usually avoided due to the chance of involvement of the optic nerve and 'wipe-out' especially in advance cases, and peri-bulbar anaesthesia can increase the intraocular pressure (IOP). Patients with only eye also require special consideration . According to the responses we gathered, majority of surgeons (63.39%) prefer sub-tenon's anaesthesia with or without ocular massage/weight & Honan balloon (48.39% without ocular massage/weight & Honan balloon). This is quite a shift from the original national trabeculectomy survey where only 5% of cases were done under sub-tenon's block . Although sub-tenon's block was first described by Turnbull in 1884  it was revisited and popularized in the 1990s by several workers including Hansen  and Stevens  and has continued to become increasingly popular worldwide. It appears to be the most frequently performed ophthalmic anaesthetic block in many countries, including the UK. A one-year national survey of current practices for cataract surgery in the UK in 2003 indicated that sub-tenon's anaesthesia was used for 43% of cataract surgeries (up from 7% in 1996), in comparison to 31% for peribulbar and 21% for topical anesthesia . Studies have also shown less IOP elevation with subtenon's block as compared to peribulbar block  and higher risks of ocular perforation from peribulbar block [34,35]. This trend of increasing popularity of subtenon's block for the various above reasons seems to have been responsible for the results we had with almost two thirds of trabeculectomies being performed under sub-tenon's block in the UK. General anaesthesia (GA) is the next preferred anaesthetic (33%) with 13% of surgeons preferring to perform trabeculectomy under general anaesthesia for all patients and 20% of all surgeons prefer GA for advanced cases. With regards to long-term control of IOP, there is no good evidence to indicate that any anaesthesia technique is better than another  Despite this, the high percentage of preference for GA may be due to the assumption that GA would not lead to elevated IOP and sight threatening complications including the risk of 'wipe out' therefore would be lower. Kirwan, et al. reported a relatively high proportion of trabeculectomies performed under general anaesthesia (24%) in their recent series. This, however, does not seem to be a new trend as in the original national trabeculectomy survey, 35.7% cases were done under GA . This preference to GA may indicate individual surgeon's preference for a more controlled surgical environment and possibly improve the safety of trabeculectomy. In our survey 25% of the surgeons prefer peri-bulbar block with or without ocular massage/weight & Honan balloon, this is a significant downward shift from 46.8% in that of the original national trabeculectomy survey . There are reports of using topical anaesthesia with or without subconjunctival and or intra-cameral anaesthesia [27,36,37]. In our survey, topical anaesthesia with or without intra-cameral unpreserved anaesthesia is preferred by 6% of surgeons. Due to lack of guidance and good evidence regarding type of anaesthesia for trabeculectomy, it's usually the surgeons' discretion to decide which anaesthesia will be good for a particular case after discussing with the particular patient. After the first description of trabeculectomy surgery by Cairns in 1968,  it was adapted as the gold standard for the management of advanced and advancing glaucoma. The procedure has been further improved and refined in the past decades to make it safer. Moorfields safer surgery technique was a modification of the actual procedure which gave better control of post-operative IOP control as well as made the surgery much safer [9,38]. As per our survey results, overall 86% of the surgeons perform Moorfields safer surgery technique for trabeculectomy, with 2/3 of them using their self-modified Moorfields technique. This indicates that majority of the glaucoma specialists are following the best current evidence and practice regarding trabeculectomy. Original Cairns technique is not that popular now, and only 7% surgeons perform their self-modified cairns technique. The rest of the surgeons use their own technique. The use of the antimetabolites is an important component of the trabeculectomy surgery as it inhibits fibroblasts and decreases the chances of scarring . Over ninety eight percent of respondents in our survey use antimetabolites during trabeculectomy and 1.53% never use antimetabolites. Our results are quite different to the study done by Siriwardena in 2004 which concluded that 18% of surgeons never use any antimetabolites, and only 9% of surgeons used antimetabolites in more than half their cases. The majority of the surgeons were performing surgeries with antimetabolites in less than half their cases . In a recent multicentre cross-sectional retrospective study of 400 cases done in 2013, Kirwan and associates found that antimetabolites were used in 93% of trabeculectomies . There seems to be an increasing trend towards the use of antimetabolites in glaucoma surgery now. Use of antimetabolites in elderly patients and with conjunctival thinning has been a controversial topic and some would avoid antimetabolites in high myopes and patients with very thin conjunctiva . As per our survey 67% of surgeons always use antimetabolites in trabeculectomy surgery irrespective of the circumstances, 31% of the surgeons only avoid antimetabolites in patients with very thin conjunctiva and where there is an increased risk of bleb leakage and hypotony, 2% of the surgeons avoid antimetabolites in patients older in 70 years, and especially if they are Caucasians and may choose a non-penetrating glaucoma surgery instead. The trends regarding the choice of the antimetabolites have also changed over the years. Our results show that 81% of surgeons only use mitomycin C for trabeculectomy, 17.57% use mostly MMC but occasionally 5 fluorouracil (5 FU) and two surgeons (1.53%) opting only for 5-FU. So overall, more than 98% of the glaucoma surgeons use MMC during trabeculectomy. In the USA over 85% of glaucoma specialists was reported to use MMC . In their paper 'Trabeculectomy in the 21st century: a multicenter analysis' Kirwan, et al. reported MMC use in 63% of cases, 5-FU use in 30% and no antimetabolite use in 7% of their cases. In comparison to National Survey of Antimetabolite use in UK done in 2004 where 93% of surgeons performing trabeculectomy with antimetabolites used 5-F . It is quite apparent that glaucoma surgeons are shifting to MMC and there is available current evidence which has facilitated this transition. Current evidence points towards higher rates of complete and qualified surgical success which is not associated with increased incidences of postoperative complications with the use of MMC as compared to 5-FU . Our survey also showed that 17% surgeons use either of the two antimetabolites. The concentration of antimetabolites used in initial randomised control trials comparing their efficacy were 0.4 mg/ml for MMC and 50 mg/ml for 5-fluorouracil  and both the agents proved to be equally effective. The National survey of antimetabolite use in trabeculectomy showed that surgeons used different concentrations of MMC ranging from 0.1 to 0.5 mg/ml with the majority (52%) using 0.2 mg/ml . The survey didn't address the concentration of 5-FU used. Our survey results show that more surgeons are now using decreased concentration of antimetabolites, with 79% using 0.2 mg/ml of MMC, with only 20% using concentration of 0.4 mg/ml. The surgeons using 5-FU prefer to use 25 mg/ml of the concentration now. A small percent (8%) of surgeons use concentration between 0.1 mg/ml to 0.5 mg/ml of MMC depending on patient factors. Although there is not much data on the comparison of the application techniques of the antimetabolites, a study by Beatty in 1998 showed that under the scleral flap application of MMC was as effective as sub-conjunctival application . A study in 2010 addressed the area of scleral application as a predictor of the success of trabeculectomy with a big peripheral diffuse bleb . Results of our survey show that majority of the surgeons (60%) apply anti-metabolite on the sclera just after conjunctival peritomy and before creating partial thickness scleral flap. About 23% of surgeons apply antimetabolites after the formation of the partial thickness flap, both under and over the flap. About 9% of the surgeons make a decision based on the particular case and a minority of the surgeons inject it sub-conjunctivally before starting the surgery and don't wash it out. According to the national survey of antimetabolite use in glaucoma surgery in the UK done in 2004, 73% of surgeons applied MMC for 2-4 minutes . According to our survey, most surgeons (56%) applied MMC for 3 minutes, followed by 16.6% applying it for 2 minutes. About 13% of the surgeons apply MMC for 1-3 minutes depending on the individual case. Surgeons using 5-FU, apply it for longer duration as compared to MMC. A small number of surgeons inject MMC sub-conjunctivally, so it stays there for a longer duration. Duration of application as used in previous studies and trials have been around 2 minutes for MMC and 5 minutes for 5-FU. The Moorfields safe surgery technique recommendations have improved surgical success of trabeculectomy as well as making this invasive procedure safer. One of the recommendations is the use of an anterior chamber (AC) maintainer which keeps the AC deep and stable thereby reducing the risk of hypotony and irido-corneal contact and consequent corneal endothelial cell loss [9,44]. There has been an increased trend towards the use of AC maintainer as shown by our survey, with 55% of surgeons using AC maintainer and 18.9% would always use it. Although peripheral iridectomy induces an inflammatory response, and may result in vitreous loss and bleed, it has been a core component of the filtration procedures for the last 100 years . A retrospective chart review of 75 eyes which underwent trabeculectomy with and without peripheral iridectomy, showed no statistically significant difference in intraocular pressure control between the two groups, although the eyes undergoing iridectomy were more inflamed . The study recommends avoidance of iridectomy in eyes not prone to shallowing of anterior chamber postoperatively. Our survey results show that 88% of the surgeons always perform an iridectomy and 12% avoid it in pseudophakes, high myopes and for patients on anticoagulants. On the question of the future of trabeculectomy surgery, less than half (44%) felt that it was the gold standard and is here to stay, the majority (69%) felt that trabeculectomy and MIGS could happily co-exist in harmony and may be used to manage patients accordingly. Five percent felt that the future of trabeculectomy is questionable as it is too unpredictable; however, only 0.83% felt that the future of trabeculectomy is in danger from MIGS. About 43% felt that the data from the original UK national trabeculectomy survey of 1996 is outdated and made most of our results look comparatively superior and a repeat national trabeculectomy audit is required. This might be due to two important factors; one, the respondents of the original UK national trabeculectomy survey of 1996 were by and large non-glaucoma specialists (77.5%) and only 22.5% were glaucoma specialists, whereas our survey is glaucoma specific with 88% of the UK based glaucoma consultants completing the survey. Glaucoma specialists performing regular trabeculectomy may be expected to have better results overall. The second point being, the various modifications and refinements in the practice of trabeculectomy over the last two decades have led to continual improvement of the outcome. Although safer than ever before, trabeculectomy is an invasive surgery and there are various notable complications and the ever-present risk of failure [21,47]. There is therefore a continuous search for a safer and more effective glaucoma surgery; especially, for an elderly patient group where MIGS might be preferred by some as a half-way house. Lisa Young  in her article 'Co-managing MIGS: The Birth of the Middle Class' writes about the changing perceptions among glaucoma specialists is that glaucoma surgery is no longer a high-risk, high-reward venture but towards much safer but more modestly beneficial options. As our glaucoma patients are living longer with increasing longevity the presentation of glaucoma and subsequent and eventual surgical intervention is relatively later with longer median time from diagnosis to surgery. In the UKGTS (United Kingdom Glaucoma Treatment Study)  the average age of newly diagnosed (untreated) glaucoma was 66 years and expectedly the age when a surgical intervention would be required may be quite a few years down the line. It may not be as early as the mean age of 69.2 years and the median time from diagnosis of glaucoma to surgery may also not be merely 2.7 years as in the UK national trabeculectomy survey from 1996 [23, 50]. In Dudley the average age of newly diagnosed glaucoma is 63 years and the average age for trabeculectomy is 73.35 years, with the average time from diagnosis to trabeculectomy being over 10 years. Untreated glaucoma takes on an average of 15 years to progress from early damage to blindness with an IOP of 21 to 25 mmHg, 7 years with IOP of 25 to 30 mmHg, and 3 years with an IOP of more than 30 mmHg. Clearly, treated glaucoma would progress slower [50,51]. In the ongoing works on iStents and trabeculotomy using Kahook Dual Blade (KDB) in our department the average age at surgery in both groups is 76 years. Current life expectancy at 75 years of age in England is 12 years for males and 13 years for females . A relatively short life expectancy and the slow rate of visual field loss in treated patients seems to explain why most patients with chronic open angle glaucoma do not go blind in their lifetime and therefore a very low level of target IOP may not always be an absolute necessity [53-55]. For a cohort of increasingly elderly patients with multiple co-existing systemic comorbidities with a 'sick eye in a sick body'  and where a very low IOP is not the target, where a mid-teen IOP would just be fine, MIGS may be seen as increasingly appealing [14-16,18,19,57]. This trend was also similarly found by Desai, et al. in the USA, during their survey of practice preferences for glaucoma surgery: a survey of the American Glaucoma Society members showed decreasing trend in trabeculectomy surgery from 80.8% in 1996 to 45.5% in 2008  Medicare fee-for-service paid claims data between1994-2012 from the USA  revealed trabeculectomies in eyes without previous scarring decreased by 52% from 54,224 in 1994 to 25,758 in 2003 and by a further 52% to 12,279 in 2012. Trabeculectomies in eyes with scarring ranged from 9054 to 13,604 between 1994-2003, but then decreased by a further 48% from 11,018 to 5728 between 2003-2012. The highest annual rate of trabeculectomy in the UK was performed in 1995 (21600 trabeculectomies were performed on 4% of glaucoma patients in 1995) , this was followed by a sharp decline. The number of trabeculectomies had fallen progressively by 7%, 23%, 37% and 53% in the 4 years following that peak . The available data shows a progressive fall in the number of trabeculectomies performed since 1995/6, with an overall reduction of more than 50% [59,60]. In a survey of all practicing Australian and New Zealand Fellows of the Royal Australia and New Zealand College of Ophthalmologists in July 2005, 75% of ophthalmologists performed less than 10 trabeculectomies per year . This trend of a steadily declining number of trabeculectomies may have been due to two major factors: first the increasing use of newer and powerful IOP lowering medications for longer duration [59,62] and secondly the more recent introduction and gradually increasing uptake of MIGS may have delayed or eliminated the need for trabeculectomy in some patients [14-16,18,19]. Trabeculectomy is still the most effective IOP lowering surgery performed currently but continues to an invasive surgery with associated complications. It is doubtful if any new procedure can fully replace trabeculectomy as yet, but it is gradually conceding space and increasingly sharing the limelight with newer interventions including MIGS [14,15,17-19]. The continued movement away from trabeculectomy and toward alternative IOP lowering procedures necessitates the need for well-designed clinical trials comparing these procedures to find the 'Goldilocks' glaucoma procedure and provide an evidence base upon which glaucoma surgical guidelines may be generated. A research grant of £2000 was received from Thea pharmaceuticals to conduct this project. Cook C, Foster P (2012) Epidemiology of glaucoma: what's new? Can J Ophthalmol 47: 223-226. Landers J, Martin K, Sarkies N, Bourne R, Watson P (2012) A twenty-year follow-up study of trabeculectomy: risk factors and outcomes. Ophthalmology 119: 694-702. CA W (2018) A System of Ophthalmic Operations. Being a Complete Treatise on the Operative Conduct of Ocular Diseases and Some Extraocular Conditions Causing Eye Symptoms. JAMA 1911: 1499-1500. Hirschberg J (1982) The history of ophthalmology. Bonn: Wayenborgh. USA. Cairns JE (1968) Trabeculectomy. Preliminary report of a new method. Am J Ophthalmol 66: 673-679. Sugar H (1961) Experimental trabeculectomy in glaucoma. Am J Ophthalmol 51: 623-627. K K (1967) The excision of corneoskleral tissue (trabeculectomy) as an operation for glaucoma. Bull Soc Hell Ophthal 35: 144. Razeghinejad MR, Fudemberg SJ, Spaeth GL (2012) The changing conceptual basis of trabeculectomy: a review of past and current surgical techniques. Surv Ophthalmol 57: 1-25. Khaw PT, Chiang M, Shah P, Sii F, Lockwood A, et al. (2012) Enhanced trabeculectomy: the Moorfields Safer Surgery System. Dev Ophthalmol 50: 1-28. Solus JF, Jampel HD, Tracey PA, Gilbert DL, Loyd TL, et al. (2012) Comparison of limbus-based and fornix-based trabeculectomy: success, bleb-related complications, and bleb morphology. Ophthalmology 119: 703-711. Salim S (2012) Current variations of glaucoma filtration surgery. Curr Opin Ophthalmol 23: 89-95. Wilkins M, Indar A, Wormald R (2005) Intra-operative mitomycin C for glaucoma surgery. Cochrane Database Syst Rev: CD002897. Jones E, Clarke J, Khaw PT (2005) Recent advances in trabeculectomy technique. Curr Opin Ophthalmol 16: 107-113. Richter GM, Coleman AL (2016) Minimally invasive glaucoma surgery: current status and future prospects. Clin Ophthalmol 10: 189-206. Kerr NM, Wang J, Barton K (2017) Minimally invasive glaucoma surgery as primary stand-alone surgery for glaucoma. Clin Exp Ophthalmol 45: 393-400. Mosaed S, Dustin L, Minckler DS (2009) Comparative outcomes between newer and older surgeries for glaucoma. Trans Am Ophthalmol Soc 107: 127-133. Mosaed S, Chak G, Haider A, Lin KY, Minckler DS (2015) Results of Trabectome Surgery Following Failed Glaucoma Tube Shunt Implantation: Cohort Study. Medicine (Baltimore) 94: e1045. Malvankar-Mehta MS, Chen YN, Iordanous Y, Wang WW, Costella J, et al. (2015) iStent as a Solo Procedure for Glaucoma Patients: A Systematic Review and Meta-Analysis. PLoS One 10: e0128146. Resende AF, Patel NS, Waisbourd M, Katz LJ (2016) iStent® Trabecular Microbypass Stent: An Update. J Ophthalmol 2016: 2731856. Tube-Shunt Surgery Guideline Preparation Committee JGS. [Guidelines for glaucoma tube-shunt surgery]. Nippon Ganka Gakkai zasshi 116: 288-293. Kirwan JF, Lockwood AJ, Shah P, Macleod A, Broadway DC, et al. (2013) Trabeculectomy in the 21st century: a multicenter analysis. Ophthalmology 120: 2532-2539. Gedde SJ, Herndon LW, Brandt JD, Budenz DL, Feuer WJ, et al. (2012) Postoperative complications in the Tube Versus Trabeculectomy (TVT) study during five years of follow-up. Am J Ophthalmol 153: 804-814. Edmunds B, Thompson JR, Salmon JF, Wormald RP (1999) The National Survey of Trabeculectomy. I. Sample and methods. Eye (Lond) 13: 524-530. Siriwardena D, Edmunds B, Wormald RP, Khaw PT (2004) National survey of antimetabolite use in glaucoma surgery in the United Kingdom. Br J Ophthalmol 88: 873-876. Ramulu PY, Corcoran KJ, Corcoran SL, Robin AL (2007) Utilization of various glaucoma surgeries and procedures in Medicare beneficiaries from 1995 to 2004. Ophthalmology 114: 2265-2270. Desai MA GS, Feuer WJ, Shi W, Chen PP, Parrish RK 2nd (2011) Practice preferences for glaucoma surgery: a survey of the American Glaucoma Society in 2008. Ophthalmic Surg Lasers Imaging 42: 202-208. Eke T (2016) Preoperative Preparation and Anesthesia for Trabeculectomy. J Curr Glaucoma Pract 10: 21-35. Edmunds B, Thompson JR, Salmon JF, Wormald RP (2001) The National Survey of Trabeculectomy. II. Variations in operative technique and outcome. Eye (Lond) 15: 441-448. Turnbull C (1884) The hydrochlorate of cocaine, a judicious opinion of its merits. Med Surg Rep 29: 628-629. Hansen EA, Mein CE, Mazzoli R (1990) Ocular anesthesia for cataract surgery: a direct sub-Tenon's approach. Ophthalmic Surg 21: 696-699. Stevens JD (1992) A new local anesthesia technique for cataract extraction by one quadrant sub-Tenon's infiltration. Br J Ophthalmol 76: 670-674. Eke T, Thompson JR (2007) Serious complications of local anaesthesia for cataract surgery: a 1 year national survey in the United Kingdom. Br J Ophthalmol 91: 470-475. Azmon B, Alster Y, Lazar M, Geyer O (1999) Effectiveness of sub-Tenon's versus peribulbar anesthesia in extracapsular cataract surgery. J Cataract Refract Surg 25: 1646-1650. Gillow JT, Aggarwal RK, Kirkby GR (1996) A survey of ocular perforation during ophthalmic local anaesthesia in the United Kingdom. Eye (Lond) 10: 537-538. Rodriguez-Coleman H, Spaide R (2001) Ocular complications of needle perforations during retrobulbar and peribulbar injections. Ophthalmol Clin North Am 14: 573-579. Lai JS, Tham CC, Lam DS (2002) Topical anesthesia in phacotrabeculectomy. J Glaucoma 11: 271-274. Vicary D, McLennan S, Sun XY (1998) Topical plus subconjunctival anesthesia for phacotrabeculectomy: one year follow-up. J Cataract Refract Surg 24: 1247-1251. Dhingra S, Khaw PT (2009) The moorfields safer surgery system. Middle East Afr J Ophthalmol 16: 112-115. Giaconi JA, Law SK, Coleman AL, Caprioli J (2010) Pearls of glaucoma management: Springer: 40. De Fendi LI, Arruda GV, Scott IU, Paula JS (2013) Mitomycin C versus 5-fluorouracil as an adjunctive treatment for trabeculectomy: a meta-analysis of randomized clinical trials. Clin Exp Ophthalmol 41: 798-806. Singh K, Mehta K, Shaikh NM, Tsai JC, Moster MR, et al. (2000) Trabeculectomy with intraoperative mitomycin C versus 5-fluorouracil. Prospective randomized clinical trial. Ophthalmology 107: 2305-2309. Beatty S, Potamitis T, Kheterpal S, O'Neill EC (1998) Trabeculectomy augmented with mitomycin C application under the scleral flap. Br J Ophthalmol 82: 397-403. Melo AB, Spaeth GL (2010) A new, safer method of applying antimetabolites during glaucoma filtering surgery. Ophthalmic Surg Lasers Imaging 41: 383-385. Stalmans I, Gillis A, Lafaut AS, Zeyen T (2006) Safe trabeculectomy technique: long term outcome. Br J Ophthalmol 90: 44-47. Luke SK (1969) Complications of peripheral iridectomy. 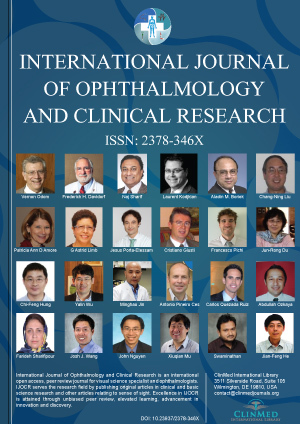 Can J Ophthalmol 4: 346-351.
de Barros DS, Da Silva RS, Siam GA, Gheith ME, Nunes CM, et al. (2009) Should an iridectomy be routinely performed as a part of trabeculectomy? Two surgeons' clinical experience. Eye (Lond) 23: 362-367. Edmunds B, Thompson JR, Salmon JF, Wormald RP (2002) The National Survey of Trabeculectomy. III. Early and late complications. Eye (Lond) 16: 297-303. Young LM (2014) Comanaging MIGS: The Birth of the Middle Class. Lascaratos G, Garway-Heath DF, Burton R, Bunce C, Xing W, et al. (2013) The United Kingdom Glaucoma Treatment Study: a multicenter, randomized, double-masked, placebo-controlled trial: baseline characteristics. Ophthalmology 120: 2540-2545. Heijl A, Buchholz P, Norrgren G, Bengtsson B (2013) Rates of visual field progression in clinical glaucoma care. Acta Ophthalmol 91: 406-412. De Moraes CG, Juthani VJ, Liebmann JM, Teng CC, Tello C, et al. (2011) Risk factors for visual field progression in treated glaucoma. Arch Ophthalmol 129: 562-568. A new report by Public Health England (PHE) (2016) Life expectancy at older ages is the highest it's ever been. Chen PP (2003) Blindness in patients with treated open-angle glaucoma. Ophthalmology 110: 726-733. Oliver JE, Hattenhauer MG, Herman D, Hodge DO, Kennedy R, et al. (2002) Blindness and glaucoma: a comparison of patients progressing to blindness from glaucoma with patients maintaining vision. Am J Ophthalmol 133: 764-772. Hattenhauer MG, Johnson DH, Ing HH, Herman DC, Hodge DO, et al. (1998) The probability of blindness from open-angle glaucoma. Ophthalmology 105: 2099-2104. Pache M, Flammer J (2006) A sick eye in a sick body? Systemic findings in patients with primary open-angle glaucoma. Surv Ophthalmol 51: 179-212. Mizoguchi T, Nishigaki S, Sato T, Wakiyama H, Ogino N (2015) Clinical results of Trabectome surgery for open-angle glaucoma. Clin Ophthalmol 9: 1889-1894. Arora KS, Robin AL, Corcoran KJ, Corcoran SL, Ramulu PY (2015) Use of Various Glaucoma Surgeries and Procedures in Medicare Beneficiaries from 1994 to 2012. Ophthalmology 122: 1615-1624. Whittaker KW, Gillow JT, Cunliffe IA (2001) Is the role of trabeculectomy in glaucoma management changing? Eye (Lond) 15: 449-452. Murphy C, Ogston S, Cobb C, MacEwen C (2015) Recent trends in glaucoma surgery in Scotland, England and Wales. Br J Ophthalmol 99: 308-312. Liu L, Siriwardena D, Khaw PT (2008) Australia and New Zealand survey of antimetabolite and steroid use in trabeculectomy surgery. J Glaucoma 17: 423-430. Bateman DN, Clark R, Azuara-Blanco A, Bain M, Forrest J (2001) The impact of new drugs on management of glaucoma in Scotland: observational study. BMJ 323: 1401-1402. Mr. Akash Raj, MD, FRCS, FRCOphth, Consultant Ophthalmologist, Department of Ophthalmology, Russells Hall Hospital, Pensnett Road, Dudley, DY1 2HQ, United Kingdom. © 2018 Raj A, et al. This is an open-access article distributed under the terms of the Creative Commons Attribution License, which permits unrestricted use, distribution, and reproduction in any medium, provided the original author and source are credited.